Felice J. Levine is executive director of the American Educational Research Association (AERA). She was previously executive officer of the American Sociological Association. She also was director of the Law and Social Science Program at the National Science Foundation. Levine’s work focuses on research and science policy issues, research ethics, data access and sharing, use of big data, the scientific and academic workforce, and higher education. Levine is Chair of the Board of the Consortium of Social Science Associations, member of the Board of the Council of Professional Associations on Federal Statistics, and a member-at-large of the Social, Political, and Economic Sciences Section of the American Association for the Advancement of Science (AAAS). 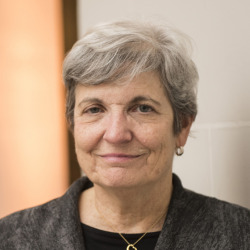 She is also on the Board of Databrary and a member of the National Academy of Sciences Roundtable on the Communication and Use of Social and Behavioral Sciences. Levine is a fellow of AAAS, AERA, and the Association for Psychological Science, and is an elected member of the International Statistical Institute. Levine is immediate Past-President of the World Education Research Association (WERA) and is co-editor of the WERA book series on Global Perspectives on Education Research published by Routledge. Levine holds A.B., A.M., and Ph.D. degrees, respectively, in sociology and psychology from the University of Chicago.